Log Analyzer is an auxiliary application for HostMonitor, it is included into Advanced Host Monitor package. Professional, Advanced and Enterprise licenses for Advanced Host Monitor include a license for Log Analyzer. Starter license holders may order Log Analyzer separately. As you know HostMonitor is able to log test results into a log file. Log Analyzer is a graphical tool that visualizes the log data. It parses the contents of a log file and presents the data as a variety of charts representing different test statistics. Log Analyzer may analyze all types of log files: HTML, Text, and DBF log files. In a second, administrator can get a snap shot of the host performance over a period of days or even months. Scripting support allows you to create reports automatically. Also, each pane provides popup menu that allows you to open full screen chart, copy image to clipboard or print image on your printer. "Test log" pane on right side of the window provides "Erase line" and "Erase top value" menu items. "Erase top value" popup menu item allows you to remove (temporarily) log record with top (maximum) reply value for selected test item. This option is useful when you want to remove one or several records with outstanding results from the chart. Log Analyzer does not remove records from the file or database, just skips the record from analyzing process. Similar "Erase line" popup menu item allows you to remove (skip) specific log record (it removes current line). Log Analyzer version 5+ may analyze log records which are stored in various databases. Before using such logs you should describe database parameters. "ODBC logs Manager" dialog (that is available thru menu File -> Setup ODBC logs) allows you to create special profiles where each profile describes one log. Name of the profile - log will be available for loading under this name. E.g. if you named profile as "HMLog-Oracle", you will be able to load such log using script command "LoadTable HMLog-Oracle". You may use any name but it should be unique. This option defines actual fields in the table which contain the information about the test (HostMonitor's ODBC logging could be configured in different ways). Provide the name of a field which stores information about the test method. Specify name of the field that stores test ID. Normally Log Analyzer collects information considering TestID as test property with high priority (test name can be changed by operator while test ID never changes). In particular this means you will see single item in the report even if you renamed the test item several times. Log Analyzer will show latest used test name but collect test statistics using all recorded names. Also, if you have 2 test items with the same name, Log Analyzer will show 2 items separating statistics using TestID. Log Analyzer warns you when you "forget" to specify TestID field however it allows you to save and use such profile. If you setup ODBC log profile without using TestID field, Log Analyzer will process data provided by such log in different way. It will collect statistics using test name and test method. E.g. report will display several items for single TCP test when port specified for the test was changed or test name was changed. Mark this option if the field which stores date and time of the event is of text type (not datetime or timestamp). Please note: this option is available when date&time field(s) of the table is of timestamp or datetime type (not text field). If the field is of the text type, then an entire table will be analyzed. Test button executes SQL query and checks the result, showing warning/error messages in case of some problem. This is useful for validation of your settings. Once log profile is set, you may analyze data using "Load ODBC log" or "Append ODBC log" items of the File menu. Also data could be loaded in automatic mode (for details refer to Script section of this manual). The following options allow you to analyze test results for certain time period. E.g. Log Analyzer may calculate statistics (alive/dead ratio, average reply, etc) for 2 months period during business hours. This option allows you to specify the date 'window'. Statistics will be calculated for specified days only. Only log records which fall within specified date range will be displayed and considered for statistics. You may provide start date and/or end date. 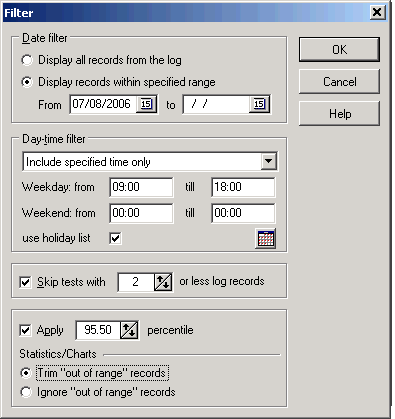 Only log records which fall within specified time will be displayed and considered for statistics. You may specify separate time intervals for weekdays and for weekends. If you specify 00:00-23:59 interval, all records will be calculated. If you specify 00:00-00:00 interval, all records for the day will be ignored. Exclude log records within specified interval - do not display these records and do not include them in statistics. You may specify separate time intervals for weekdays and for weekends. If you specify 00:00-23:59 interval, all records for the day will be ignored. If you specify 00:00-00:00 interval, all records will be calculated. This option tells Log Analyzer to process holidays in the same way it processes weekends (including or excluding some time intervals). Note: Log Analyzer allows you to check list of holidays however Log Analyzer does not allow you to change this list. Use HostMonitor or RCC GUI to modify the list (menu Profiles -> Schedules -> Holidays). If Log Analyzer is installed on different system then you need to copy holidays.lst file from system where HostMonitor is installed. This filter option tells Log Analyzer to exclude from statistics test items with <N> or less records in the log. These skipped test items will not be included into the reports either. "Apply N percentile" option tells application to ignore or trim out-of-range records. When enabled, this option has effect on "quick" and "full screen" charts, statistics and reports. For example, if you set "Apply 90 percentile", Log Analyzer will trim (or skip) 10% of records with highest reply numbers. Application will perform this operation for each test item so highest reply values of "Traffic on hostA" test item will not be mixed with highest reply numbers of "CPU usage on host B" test. Use Ignore parameter when you want to skip all out-of-range records. This option may have effect on alive/dead statistic results as well because some records just ignored. On left mouse click Quick Chart may show log record related to the selected point. If you click on displayed label, Log Analyzer will scroll test related log to this record. when you move mouse with button pressed, Quick Chart will show log record related to new selected point, exact point. However if there are thousands of records in the log for the test, then each point on screen may represent several log records (one point on chart represents some time interval). In this case application selects log record with minimum or maximum value (depending on test method) related to the point. To display a chart in a full screen window, choose the item "Full screen chart" from the popup menu (this menu appears when you right-click in the Log Analyzer window). Starting from version 3.50 Log Analyzer allows zooming in and out over the selected area of a chart. To zoom in on a chart area, hold the left mouse button and drag mouse down and right. You will see a rectangle around the selected area. Release the left mouse button to zoom in. You may continue zooming again and again. To restore (undo) the zoom, drag a rectangle in the opposite direction (up and left). After you right click the chart you may change upper and lower limits of the vertical and horizontal axis using "Set bounds" popup menu item. In the Chart Bounds dialog use an "Interval to display" parameter to set what time period needs to be displayed on the graph (horizontal axis). Use "Bounds to display" parameter to set the limits for "Reply" value mapping onto a graph (vertical axis). Bounds to display (from-till) - specifies the lower and upper limits of the vertical axis. The user may change them to display the "Reply" values with a different scale. You may choose the display mode from popup menu while you work with GUI. This option is also available in each report profile in the Report Manager dialog. Note: when a lot of records selected for the test (over 7,000) then chart may automatically switch to "Display average on daily basis" or "Display average on hourly basis" mode depending on selected time interval and number of records. To close the full screen chart and return to Log Analyzer main window, press [ESC] or [Enter] or select "Close" menu item after the right click on the chart. The listbox on the left in the Report Manager dialog window contains the list of fields that you may include into the report (e. g., test name, test method, average reply, downtime, etc.). Click on the check box next to a field name to mark/unmark the item. Use "Mark all" button to select all available fields, use "Unmark all" button to deselect all items, use "Invert selection" to invert selection for the list. The list in middle selects the test types to include into the report (e. g., all tests except Ping and CPU Usage tests). Click on the check box next to a field name to mark/unmark the item. Use "Mark all" button to select all available fields or use "Clear all" button to deselect all items. "Invert selection" option is also available. Use this option when you need to exclude or include some specific tests from/into the report. E.g. if you have configured report to display HTTP tests and then have added www.yahoo.com and www.google.com HTTP tests into Black list, report will display all HTTP tests except the latter two. If you use "White list" option instead, tests specified in "white" list will be displayed in the report regardless of "Include following test (methods)" option. For example you may use this option to display all IMAP tests + several specific POP3 tests. If you want to display only tests that are specified in the "White list", unmark all test methods in the "Include following tests (methods)" option. Log Analyzer can create chart image for each test that is included in the report. Charts are stored as images in GIF file format. This parameter specifies width of the chart image (maximum possible width is 6000 pixels). This parameter specifies height of the chart image (maximum possible height is 5000 pixels). The option allows you to specify the lower and upper limits of the vertical axis. You may keep default value (Auto) or set bounds to display the "Reply" values within specified range. For example you may specify range 0-100 for report that shows CPU Usage test methods. By default Log Analyzer saves all reports into one directory (you can specify that directory in the Options dialog), and uses the name of the profile as a file name (with HTM extension). But you can specify another file name by choosing the "Put report into particular file" option and providing a path and name of the file. With this option enabled Log Analyzer will ask for confirmation if the report file that is going to be created already exists. If you enable this option a date macro variables may be specified in the destination file name. Log Analyzer will interpret text between the '%' in the file name as a macro variable, where 'DD' represents the day of the month, 'MM' - the month, 'YY' - the year (2 last digits), 'YYYY' - the year. Using these options you can provide an HTML files that will be used as a header and/or footer for the report. Mark this option only if you want to change the standard header or footer of the report. In HostMonitor's directory "Examples\LAReports\" you can find an example of the header and footer (the files: footer1.htm, header1.htm, header2.htm). %DateInterval% Information about date interval that was analyzed. E.g. "01/01/04 - 01/15/04" or "May 2005" (when the date interval covers one full month from the first to last day thereof, the variable will contain only the name of the month and year). %TimeFilter% Information about time filter in use. E.g. "Included: Weekday [09:00-18:00]", "Excluded: Weekend [00:00-23:59]". When no time filter was applied the value of this variable is "24/7". "<tr><td>%TestName%</td><td>%AverageReply%</td></tr>" (an HTML code for the header of a table should be contained in the header file). In HostMonitor's directory "Examples\LAReports\" you will find an example of such template (file templ1.htm). %DetailedLogFile% when this variable occurs in the table template, Log Analyzer creates HTML file that contains all check results for the test. It substitutes this variable with a corresponding file name. So, if you want to provide detailed log file for each test, use HTML code such as "<a href="%DetailedLogFile%">". %ImageFile% when this variable occurs in a template Log Analyzer creates GIF image that represents the test results and inserts the file name of this image file instead of the variable. So, if you want to insert images into the report, use HTML code like "<img src="%ImageFile%">". If you want to insert links to images into the report, use code like "<a href="%ImageFile%">". Offers a choice of colors for the text, background and a chart pane. By using this option you may specify a number of vertical and horizontal lines of the grid in a chart pane. You may also enable or disable grid in the log pane. By default Log Analyzer gets current Windows regional settings at startup and uses these parameters until you change Windows settings and restart application. You may use this option to define the date & time formats (e.g. DD/MM/YYYY h:mm:ss AMPM). In this case, Log Analyzer will use the specified formats overriding the system settings. BTW: Changing the date format does not affects analyzing of the DBF and HTML log files. 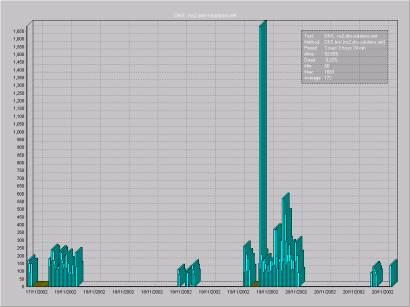 Log Analyzer is able to analyze these log files correctly regardless of the date & time settings. However this option can be useful to analyze text log files or html log files that were created by older versions of HostMonitor. You may chose the color scheme for the full screen chart on this page. Provide a path to the default destination folder for the reports. If this parameter is empty, Log Analyzer will use the directory where it was started from. In Report Manager you may specify different destination directory for some of the reports. Here you may specify a path to a separate folder where auxiliary images and detailed log files will be stored. If you specify the relative path, Log Analyzer will use "Default destination folder"+"Folder for images" as a destination path. E.g. if you have defined "C:\HostMonitor4\Reports\" as a default folder and "Images\" as folder for images, then images and detailed logs will be stored in "C:\HostMonitor4\Reports\Images\" directory. If you enable this option a date macro variables may be specified in the path. Log Analyzer will interpret the text between the '%' of the path string as a macro, where 'DD' represents the day of the month, 'MM' - the month, 'YY' - the year (2 last digits), 'YYYY' - the year. To change the color of an element, click on an element that you want to change. Use right-click to change its background color, and left-click to change the text color. The colors of the chart (GIF images) may be changed on Chart page of the Options dialog. This option specifies how "alive time" versus "dead time" percentage should be calculated. When "display all data" chart mode is selected, color of each point depends on status of the test at this specific time (e.g. green for passed probes, red for failed). specifies threshold for "bad" statuses in % of time interval. If the accrued time during which the test had bad status equals or exceeds specified percentage then the item on the chart will be displayed with "bad" color (red by default). E.g. 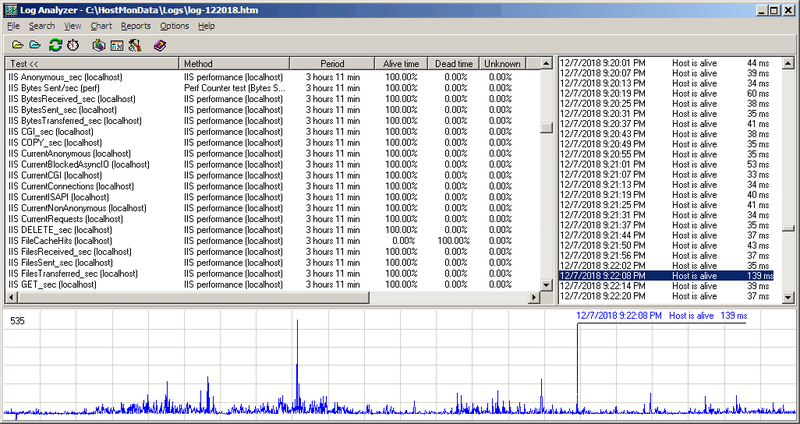 if you are using "display average on hourly basis" mode and 10% threshold, then if some host did not respond for ping test for 6 or more minutes within an hour, you will see red bar on the chart. specifies threshold for "unknown" statuses in % of time interval. If the accrued time during which the test had unknown status equals or exceeds specified percentage then the item on the chart will be displayed with "unknown" color (yellow by default). E.g. if you are using "display average on daily basis" mode and 25% threshould, then if some test had "unknown" status for 6 or more hours within a day, you will see yellow bar on the chart. Please note: "bad" status has higher priority than "unknown" status. It means if "bad" time reached specified threshold, the point will be displayed in red color regardless of how long this test had "unknown" or "good" status. Log Analyzer 4.0+ supports scripts. Scripts allow you to generate reports automatically by schedule (e.g. using standard NT scheduler). Log Analyzer Script file (default extension .LAS) is a simple text file that contains commands for the application. You can create and edit script file using any text editor (e.g. notepad). When you provide a log file name or a date filter you can use date macro variables. Log Analyzer will interpret the text between '%' in the parameter as a date macro variable, where 'DD' represents the day of the month, 'MM' - the month, 'YY' - the year (2 last digits), 'YYYY' - the year. Also you may use special date expressions. Only log records within specified time will be considered for statistics. You should specify separate time intervals for weekdays and for weekends. If you specify 00:00 23:59 interval, all records will be accounted. If you specify 00:00 00:00 interval, all records for the day will be ignored. Please note: the most resent TimeFilter command overrides any and all previous TimeFilter commands. Exclude log records within specified interval - Log Analyzer will not display these records; will not include them into statistics for specified time. You should specify separate time intervals for weekdays and for weekends. If you specify 00:00-23:59 interval, all records for the day will be ignored. If you specify 00:00-00:00 interval, all records will be calculated. Please note: the most resent TimeFilter Exclude command overrides any and all previous TimeFilter Exclude commands. SkipMode On	 Tells Log Analyzer not to display test items with <N> or less records in the log. By default <N> is set to 0, unless you specify different number using SkipLevel command. SkipLevel	 <min number of records> Do not display statistics for test items with <N> or less records in the log. SkipMode Off	 Display all test items. Even for tests that after "day-time" filtering have less records then is specified by SkipLevel command. <percentile_number> Sets percentile options and value. Use Trim parameter when you want to trim out-of-range values to maximum allowed value. Use Ignore parameter when you want to skip all out-of-range records (this option may have effect on alive/dead statistic results as well). CreateReport "HTTP tests (no charts)"
;and skip records that were added at any time on weekend. To execute a script, you should start Log Analyzer with the following command line parameter "-script:<name of script file>". There is also an optional parameter "-log:<name of the log file>". With this optional parameter Log Analyzer will record information about script execution and about errors in the script (if any) into the specified file. onetest command line parameter tells Log Analyzer to find and analyze one or several tests and ignore other test items. You may specify test ID, list of test IDs, full name of the test or text with wildcard (wildcard should be located at the beginning or at the end). When you are using HostMonitor or RCC GUI to analyze log file for specific test, HostMonitor (RCC) checks log file size and applies "onetest" switch for large files, this way Log Analyzer will load log file much faster. sets 100 MB limit. If you set 0, then "onetest" switch will not be used. When you purchase an Advanced Host Monitor Professional, Advanced or Enterprise edition you will get the license for Log Analyzer at no cost. Otherwise the license costs $45. You can order Log Analyzer using credit card, Switch and Solo debit cards, check/money order or wire transfer. If you are concerned about submitting your order and/or credit card information online, you may register the Log Analyzer via phone, fax or postal mail.